That’s because today, at the birthplace of the Blackbird – Lockheed Martin’s Skunk Works – engineers are developing a hypersonic aircraft that will go twice the speed of the SR-71. It’s called the SR-72. A hypersonic plane does not have to be an expensive, distant possibility. In fact, an SR-72 could be operational by 2030. 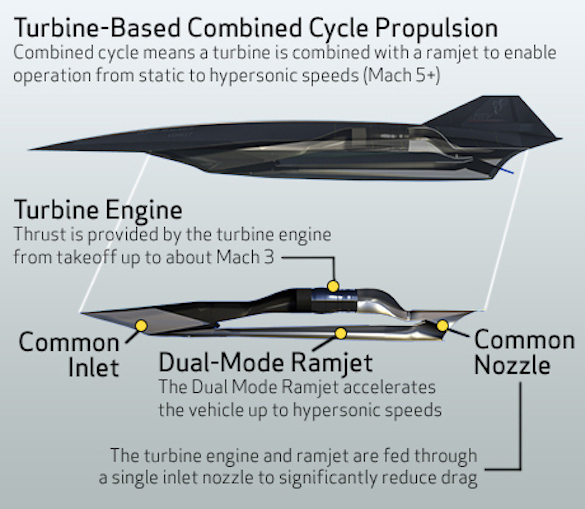 For the past several years, Lockheed Martin Skunk Works has been working with Aerojet Rocketdyne to develop a method to integrate an off-the-shelf turbine with a supersonic combustion ramjet air breathing jet engine to power the aircraft from standstill to Mach 6. The result is the SR-72 that Aviation Week has dubbed “son of Blackbird,” and integrated engine and airframe that is optimized at the system level for high performance and affordability. SR-72 is not the first hypersonic Skunk Works aircraft. In partnership with the Defense Advanced Research Projects Agency, engineers developed the rocket-launched Falcon Hypersonic Technology Vehicle 2 (HTV-2). The HTV-2 research and development project was designed to collect data on three technical challenges of hypersonic flight: aerodynamics; aerothermal effects; and guidance, navigation and control.